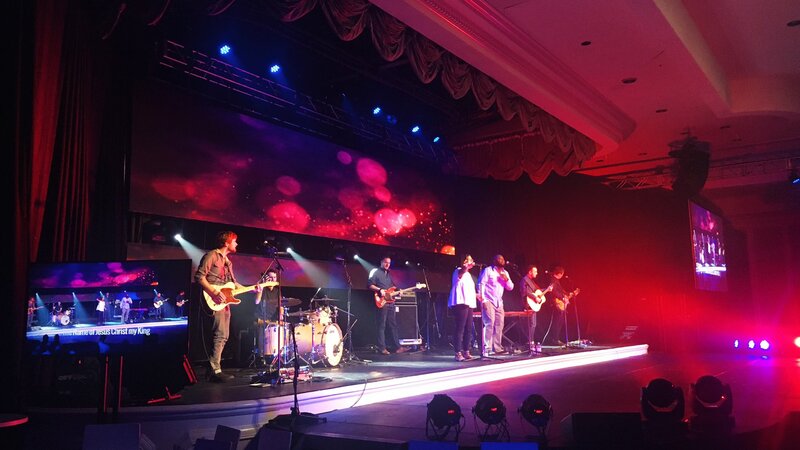 Today through Saturday, I’m with Jimmy McNeal and the band, leading worship at the ERLC conference in Nashville. The topic this year is “Christ-Centered Parenting in a Complex World”. Stream it live at live.erlc.com! I’m happy to have Sarah here with me too, though she’s technically with the South Campus Kids team. We’re treating the getaway like what it is: a nice vacation where we spend 9 hours a day drinking from a fire hydrant of knowledge about parenting! I prepared to be dismally discouraged by how incorrectly I have been parenting my child. But every talk today has been a lifted weight. The common thread in all these talks has been that our kids don’t need techniques or rules or programs. They need Jesus. There’s no perfecting in the flesh what was started by the Spirit. There’s no raising children into perfection without the blood of Christ covering a multitude of sins. Sins of the parents and sins of the children. Please join me in praying for the parents who will be aided by this conference in any number of ways. Pray that we will experience the freedom that is offered to us in Jesus, to lay down our lives for our children in light of the hope for a future with our heavenly Father, bought not by our blood sweat and tears, but by the blood sweat and tears of Jesus. A truster of the good news of Jesus. A husband and father. Currently serving as the Studio and Albums Resident at Austin Stone Community Church.